Aerial Movement is something that has evolved (independently) many times in the animal kingdom.There are two types of Aerial Movement: True flight and Gliding/Parachuting. They are useful adaptations, especially in rainforests, where they enable canopy dwellers to travel easily from tree to tree, without expending too much energy. True flight is something that is restricted to birds, bats and insects. It is distinguished from gliding and parachuting in that flying animals are able to produce thrust, to sustain their upward path. This is done by way of the “flight stroke”. It is an important thing to note that no herps are capable of true flight. However, some herptiles have evolved ingenious methods of gliding to get around their respective habitats. In this four-part series of posts, we discuss the various South-East Asian herps that are capable of gliding or parachuting. 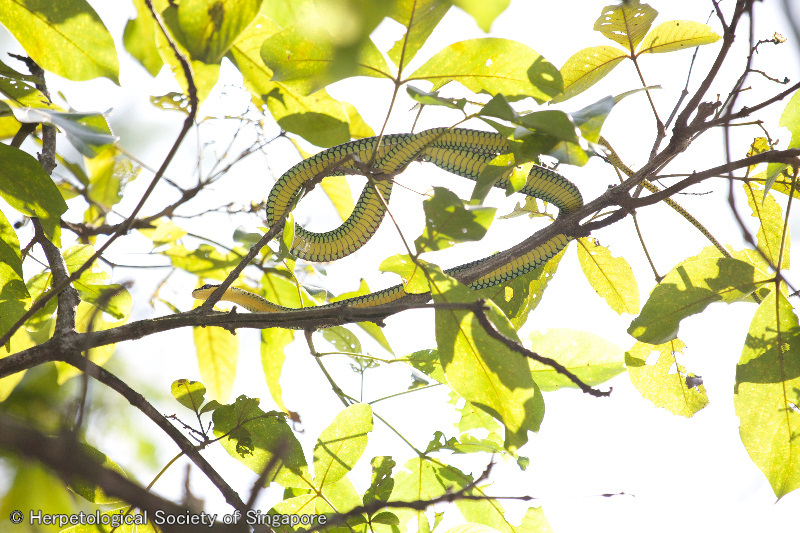 Chrysopelea, is a genus of snakes from South and South-East Asia, that are also known as ‘flying snakes’. 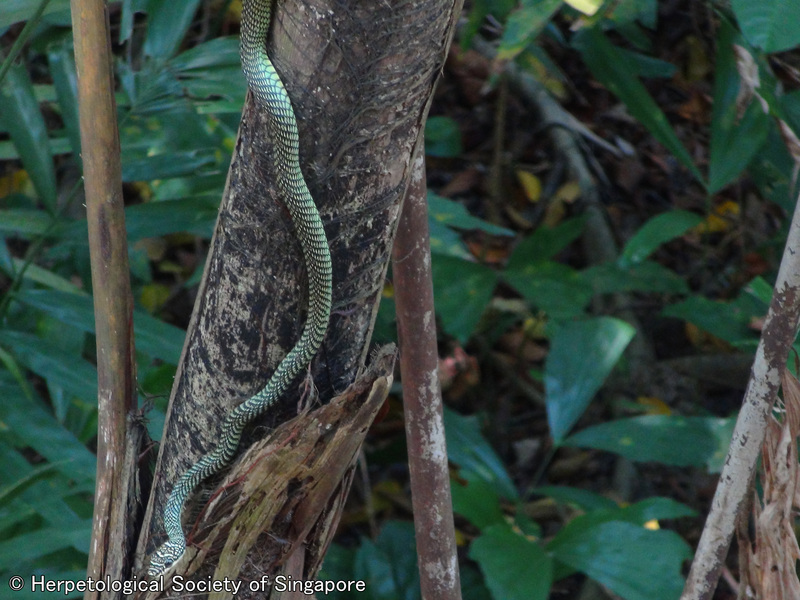 Two species, the Paradise Tree Snake (C. paradisi) and the Twin-Barred Tree Snake (C. pelias) are known to be native to Singapore, while a third species, the Golden Tree Snake (C. ornata), has been recorded  in various localities. It is not, however, native to Singapore. In most terrestrial gliders, gliding begins with a take-off. The take-off is usually accomplished by rapidly straightening bent limbs. In snakes, which lack limbs altogether, this poses a challenge. Members of the Chrysopelea genus are unique, in that they are the only limbless animals that are known to glide through the air! The gliding behaviour of Chrysopelea was observed as early as 1899. But the mechanism of this behaviour was poorly understood for a very long time, until recently. An interesting experiment was conducted in NUS in 1997. The flying snakes were placed in boxes on the third floor of the NUS Physics building. A panel in the front of the box was removed and the snake would jump out on its own to glide over a distance. You can see the pictures at this link. Another similar project was conducted at the Singapore Zoo in 2000, to map out 3-D information on the glide trajectory of C. paradisi. After several years of such intensive research, the gliding behaviour of the flying snake became better understood. Step 2: The snake then accelerates its forebody upwards and forwards, with the rear end of the body still anchored to the branch. As the snake moves away from the branch, it releases its grip and is fully airborne. At this point, it begins flattening its body. Step 3: The cylindrical shape of snakes is not very aerodynamic. So, Chrysopelea splays out its ribs to flatten its body. The ventral side of the snake will have a concavity, causing its cross-section resemble a frisbee. In doing so, it turns its body into a “wing”, with which it can glide. In doing this, the snake practically doubles in width! The flattening of the snake’s body is evident in this photo! Step 4: The flying snake moves in an undulating, “S”-shaped motion in the air. It catches the air beneath its body and glides over large distances. It is even able to maneuver to avoid obstacles and threats. A study done in 1970 even recorded an instance of a C. ornata specimen changing direction 180o in mid-air to land near the base of the tower from which it was released! Yes! Some of these amazing snakes can be found in Singapore! If you’re lucky and observant, you might get the chance to spot one. They are not harmful to humans, and feed on lizards and other small animals. 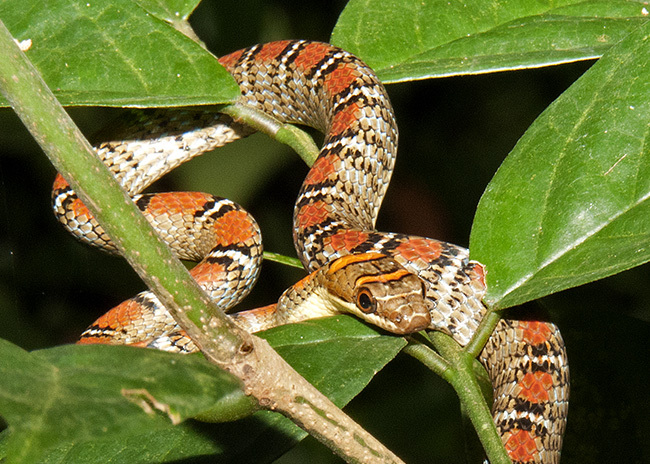 Look out for these amazing snakes next time you’re in a nature reserve or park! 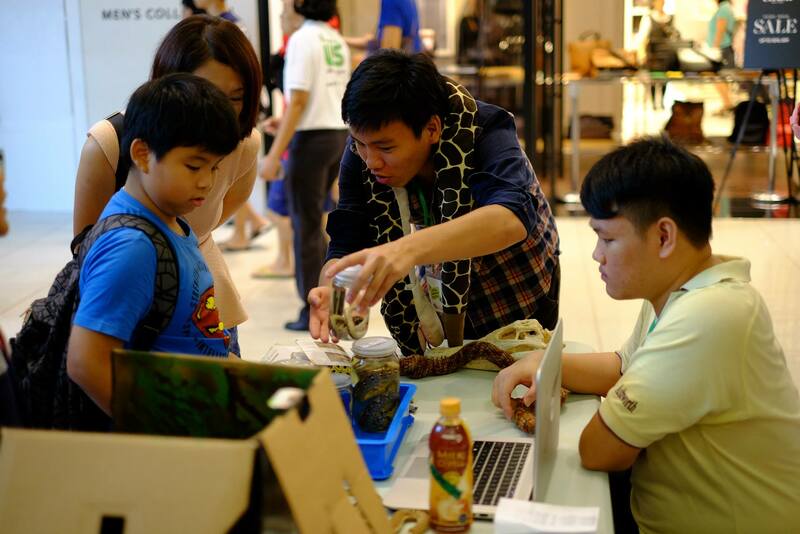 The Festival of Biodiversity is a massive annual event that brings most of the nature groups in Singapore together to spread awareness about their groups or societies and the efforts they put in to conservation. This year, it was held on the 27th and 28th of June, at Vivocity. 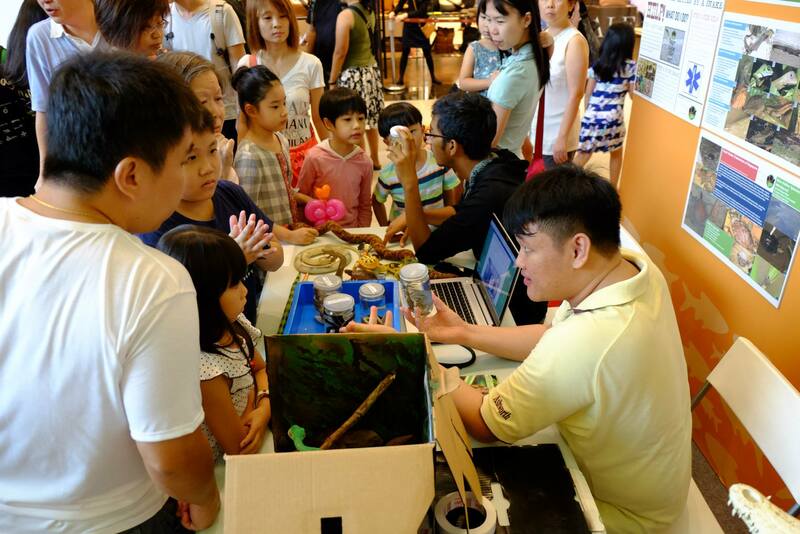 The Festival of Biodiversity gives green groups a chance to spread the conservation message to the general public and to enlighten them about Singapore’s nature. The HSS was proud to make our public de but at this year’s Festival! We eagerly set up the booth with our posters and models. We also had several herp specimens on loan from the Lee Kong Chian Natural History Museum. Once our booth was all prepped, we were ready to take on the public! It was not long before the crowds started streaming in. We were thoroughly occupied, constantly on our feet and talking animatedly to the people coming to our booth. Our fellow herper and friend Noel Thomas (far right) helped us with the setup and was kind enough to lend us some of his pictures and help us procure specimens for the booth. It was Noel who first brought us together. We were joined by Mr Joseph Koh a.k.a. the Spiderman. 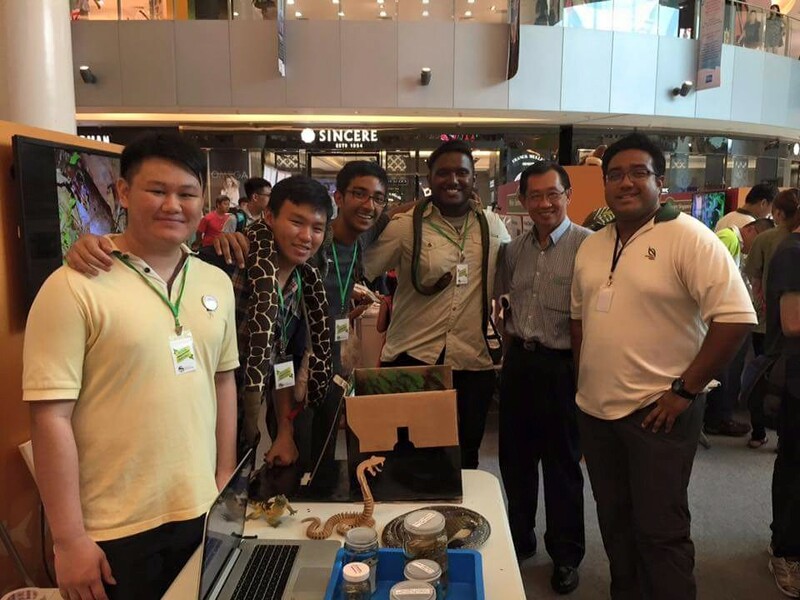 He is Singapore’s foremost expert on Spiders and it was truly an honour to receive both praise and advice from him. We met the Guest-of-Honour, Minister of State, Mr Desmond Lee. 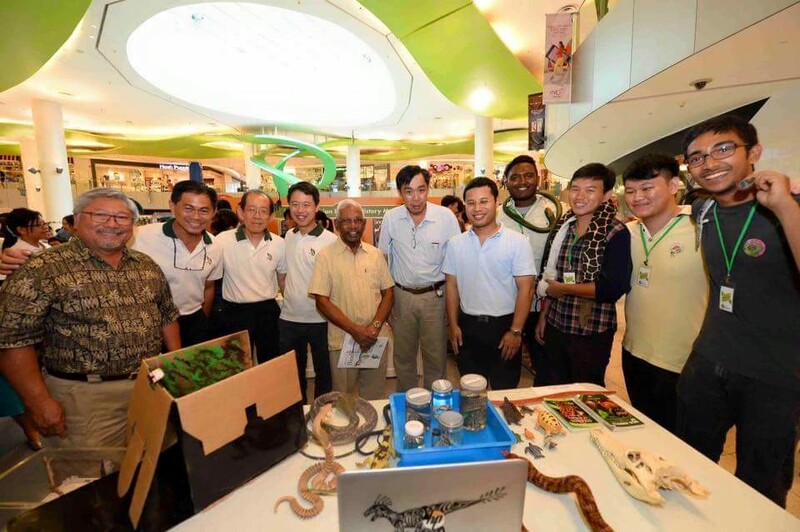 He was with former Minister, Mr S. Dhanabalan; Head of the Lee Kong Chian Natural History Museum, Professor Peter Ng; CEO of National Parks, Mr Kenneth Er; Dr Lawrence Leong and Mr Wong Tuan Wah. 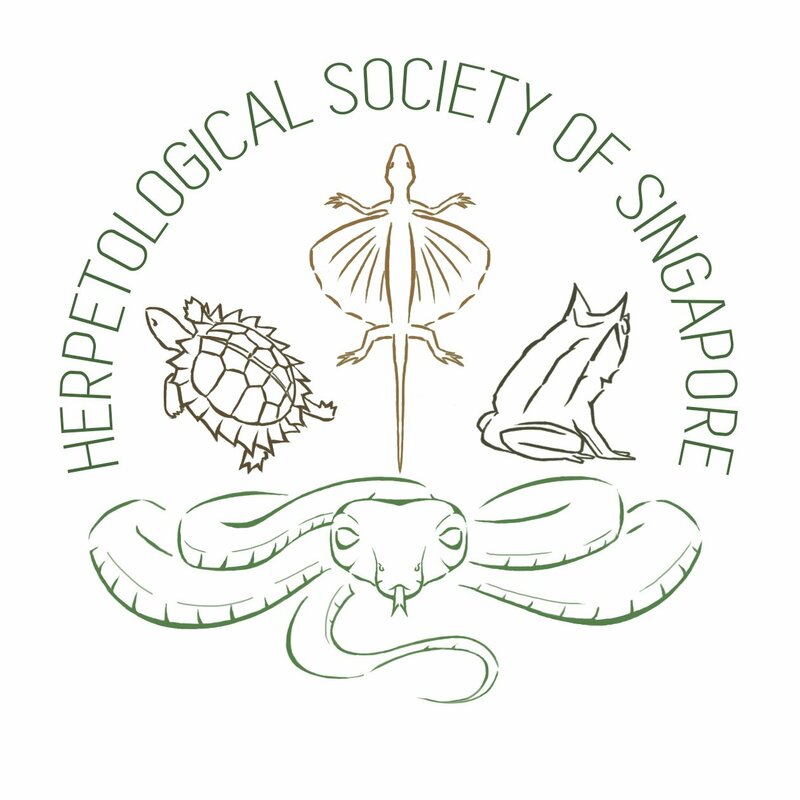 We were excited to talk to these important figures about herps, their conservation statuses and needs in Singapore. 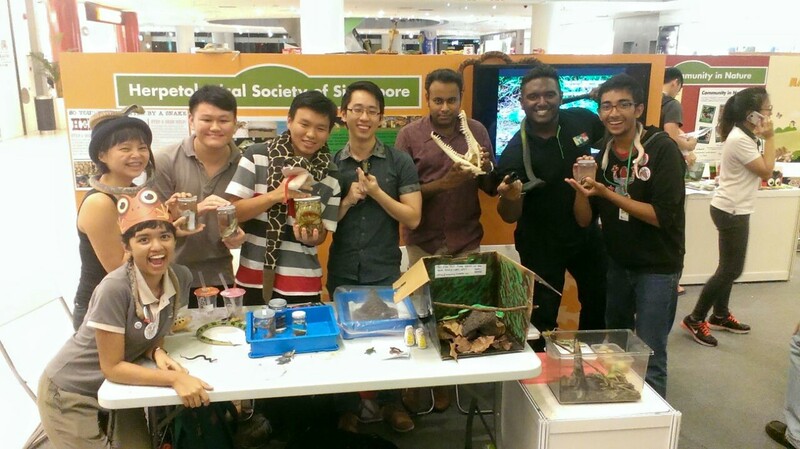 It was a privilege to meet these people, who play huge roles in Singapore’s nature conservation. It was a group picture that we could not resist taking. Over the next 2 days we were swamped with huge numbers of people from all age groups, crowding around our booth. It was such a pleasure and heart-warming sight to see so many people interested in herps. 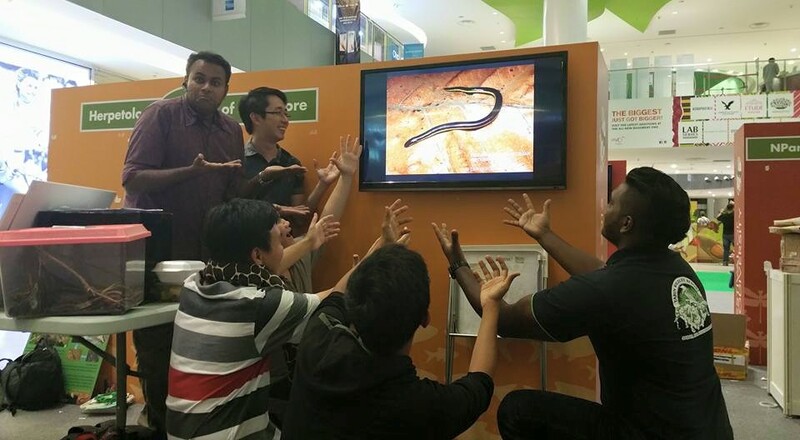 A lot of people were there to seek assurance that snakes are not the misunderstood killers that they are often made out to be. We were glad to lay their fears to rest. 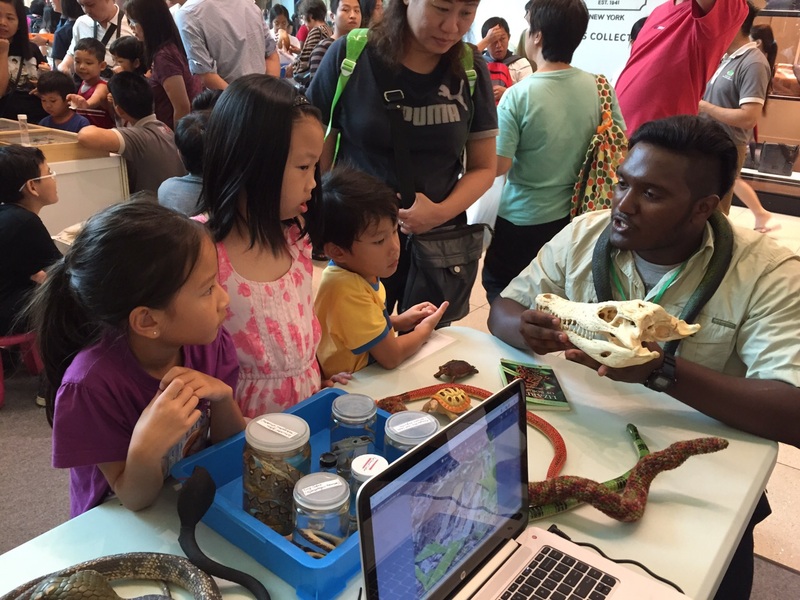 We were also really pleased to see many kids crowding around our booth, eager to learn more about herps by playing with model animals. We had a lot of toys and models for kids to play with. They were also fantastic for teaching the kids about herps and where they can be found. 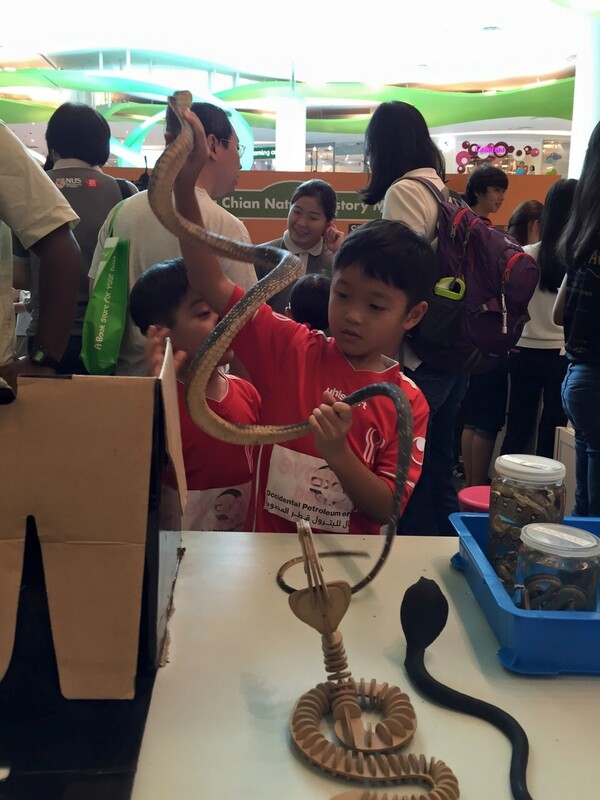 We talked to them about how important herps in Singapore are and why we should conserve them. We were really happy to see their parents learning alongside their kids. Many of them even expressed interest in future walks with us. Several youngsters were keen on working with wildlife and were not sure where to start learning and experiencing their passion. They were thrilled to learn that we would be organising walks. We too were ecstatic that we were inspiring future generations to continue the conservation march. Every single one of us was caught up in entertaining the public and sharing as much as we could. Our passion and drive really shone through and it created a unique bond with everyone that stopped by. They were happy to listen to us and we were more than happy to share. We often got down on our knees just to talk to some of the youngsters and we practically stood from morning to night. It was an amazing debut for the HSS. Like a Draco, we took a massive leap, spreading our patagium and glided for the first time. We could not have done it without the wind beneath our “wings”, that is all the people who have supported us thus far: NParks, LKCNHM and all the wonderful people at FoB, who have supported us since Day 1. A big kudos to the dedication and efforts from everyone at the booth. It was a fun and satisfying experience. The camaraderie, even between members who were meeting for the first time was amazing. We all come from different walks of life, are of different ages and differ in personality. But we stand united as one by our passion for the conservation of not just herps, but of all wildlife and their habitats. Thanks to Adriane Lee from International Coastal Cleanup Singapore, for helping us take some of these photos. Do check out their album here.